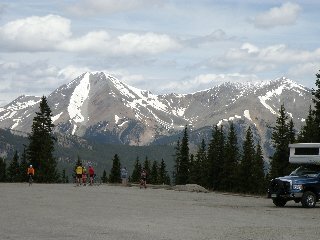 Ride the Rockies is one of my favorite rides. This year is the 4th year I've ridden (1994, 2005, 2008 were others). Our route takes us in a loop from Glenwood Springs. 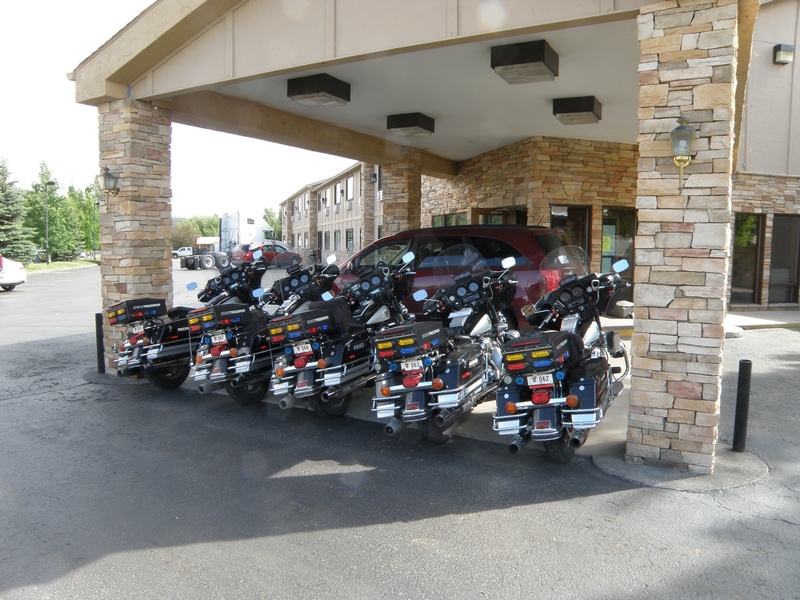 I decided to rent a car to drive to the nearest airport near Gypsum Colorado. 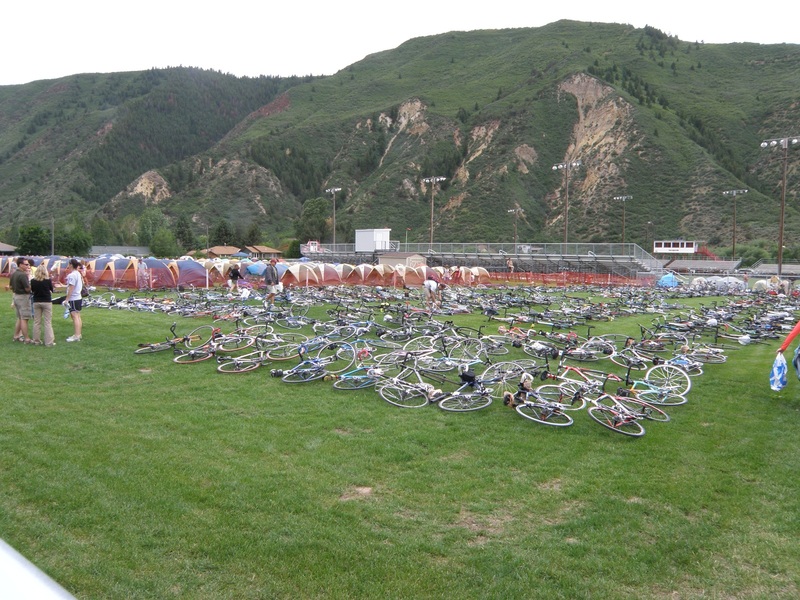 This was 27 miles from Glenwood Springs itself and a very scenic ride through the canyon. An uneventful drive to drop my car off. The airport was had to find, but eventually I found some signs to follow. They were tearing up the runway, so until August, no commercial planes landing or taking off and this meant the airport was even quieter than normal. I was early enough that I dropped my car off at the rental counter before they opened at 10am. I rode on local surface roads for the first 7 miles to get to Dotsero. There were some bike paths but their surfaces were poor and also seemed inconsistent so seemed at least as easy to ride on the roadway. My bike was fully loaded. I packed later and suspect I carried more clothes than necessary but was getting worried about cold day or two before departure. It was a nice ride and slightly downhill helped as well. 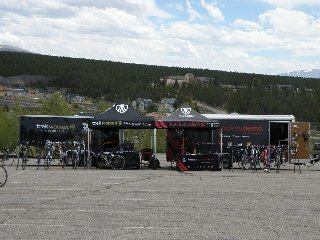 Outside Dotsero was a local bike race. I followed the race path for short while. They told me to stay to the right out of way of racers, though none came past while I was there. 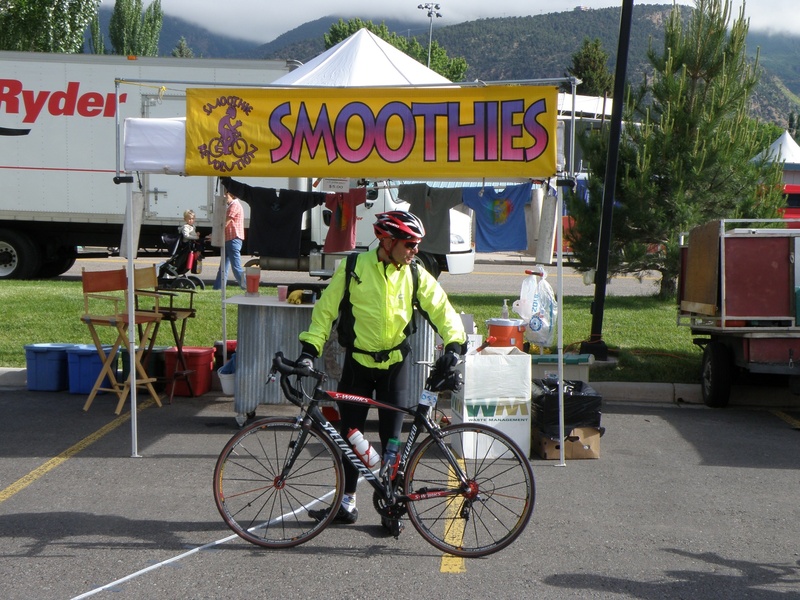 The buzz I heard later was that Lance Armstrong had decided to join some local races the day before and blew away some strong but admittedly local riders. 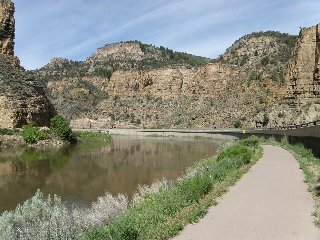 From Dotsero, I left the main roads and onto the Glenwood Canyon bike path. The canyon gradually narrowed. This was one of the last places I-70 had been completed and some of the narrowest parts of the canyon had the road stacked sometimes both on top of each other with bike path underneath. 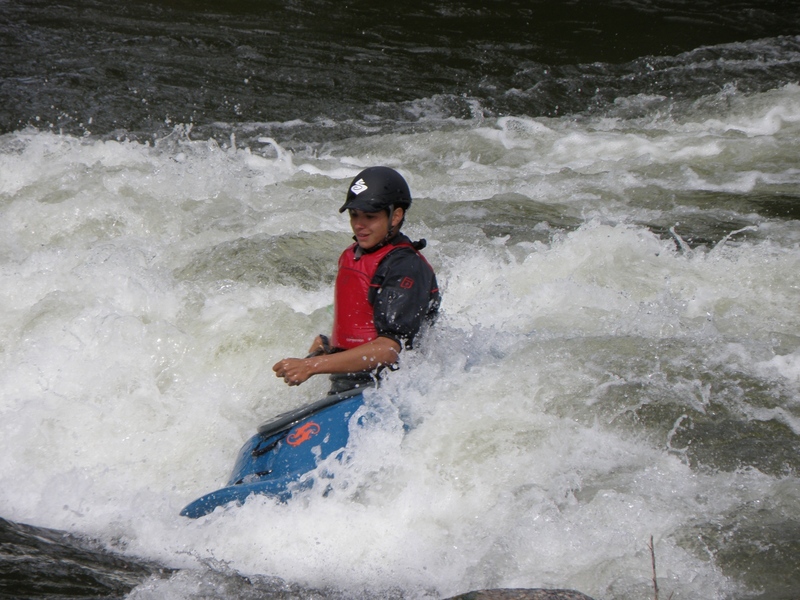 As the canyon narrowed, the wide Colorado also got some light rapids and I saw several raft companies taking tourists down the river as well. It was a nice scenic ride. 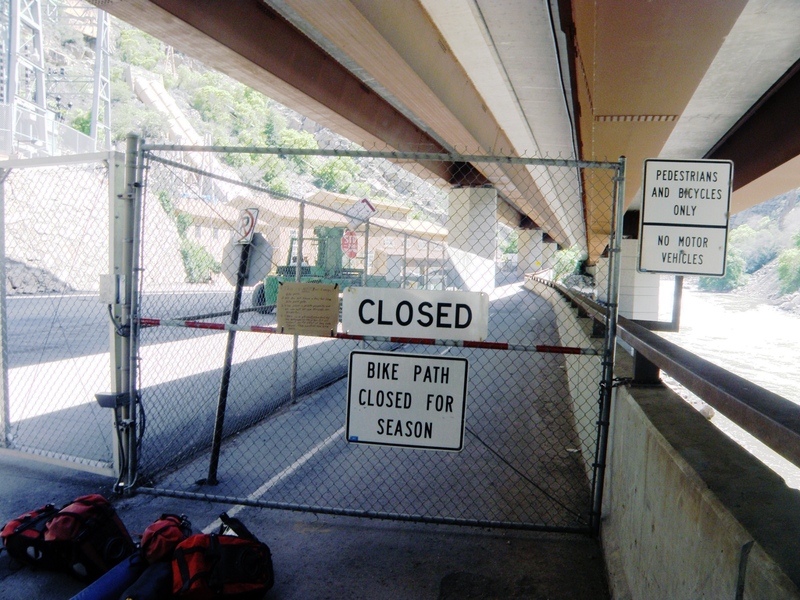 Around 12 miles came to Hanging Lake and before this, the road had left the immediate canyon so only the bike path and a railroad on opposite side were in the canyon. It was a very scenic area. Leaving the Hanging Lake area I suddenly came on a sign of "trail closed". Seemed strange but fortunately was easy to get around. From there, the trail came close to the water and in one spot there was a very slight amount of water on the road. A few more miles and I came upon a high 10 foot fence that closed off the path. Off to one side was a drop-off but potential to get around the fence. I found some other cyclists on the other side and they were willing to be handed my gear. We traded gear and bikes and fortunately got around this obstacle. Later that day, I found local chamber of commerce folks and asked if they could ask CDOT to open this path. Not too much further came to last pieces of the canyon as it slowly widened and also went up a gentle hill. 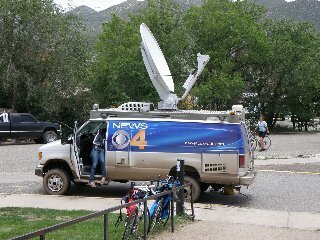 I told myself it was a slightly tough climb because all my gear, but won't have that excuse once my gear is carried on the truck. 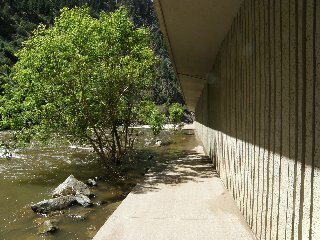 A little before noon, I finally reached Glenwood Springs and rode through town to the High School and start of the ride. While it is no longer a novelty to me as a ride veteran, let me describe a few of the logistics with the daily journal pages. I went to registration and was given a packet that included a wrist band, a bicycle tag and a luggage tag. All had a matching number. The bicycle sticker went on the bike and then I was able to drop it off in the bicycle corral which was name they used for secure area being used to watch bikes. 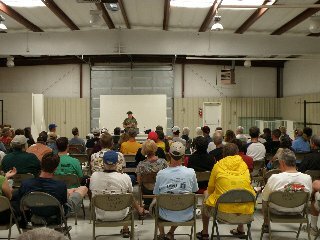 I had indoor camping option, so I carried my other gear to a large gym and picked out the "early risers" gym and put down my pad and sleeping pad. The luggage tag was assembled and put on a large duffel I had with me. Next, I looked in the local maps on our guide and found places for lunch and otherwise wandered around town. Slowly more people arrived. 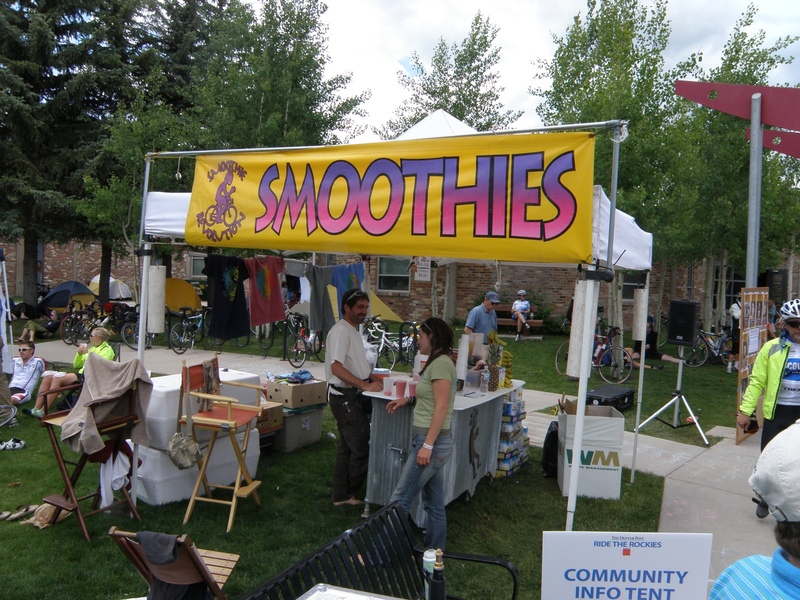 There was a bit of a buzz along many different vendor tents. Some were bike shops, some bike or bike component manufacturers and also some food. 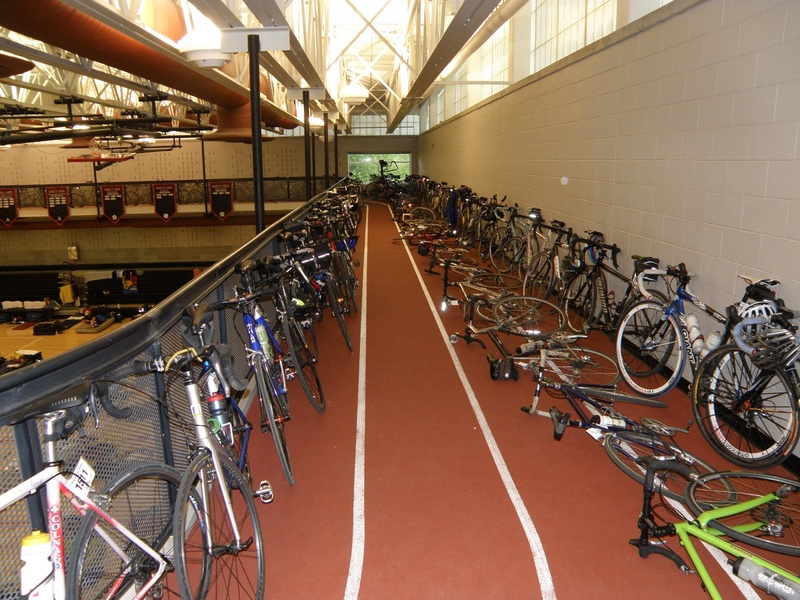 Everything a cyclist might want. 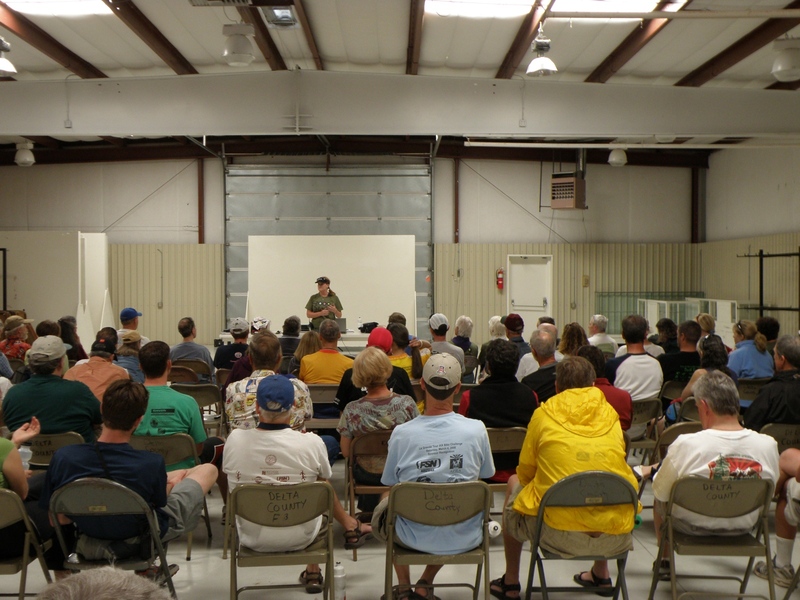 I came into a cycling safety seminar at 5:30pm and otherwise relaxed in anticipation of the day ahead. 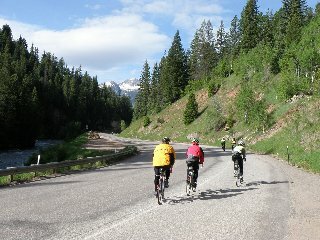 Nice to be on Ride the Rockies again. 27 miles today. 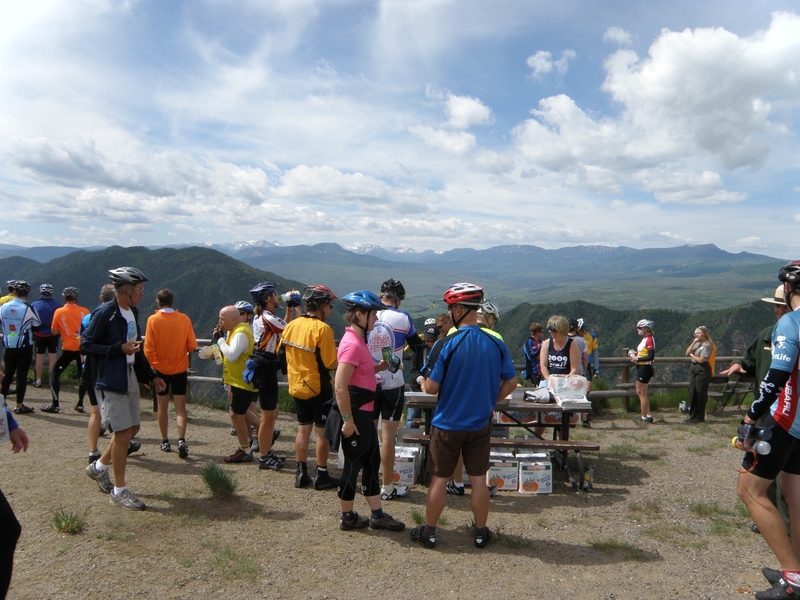 Ride the Rockies officially started today with a ride to Hotchkiss. A slightly long but otherwise straightforward ride with climbing the first half and descent the second half. I opted for the first choice, of indoor camping. The gym started coming alive around 4:30am. 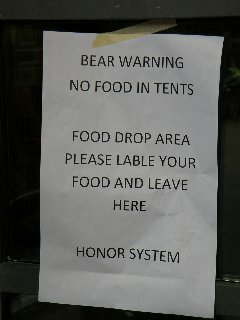 I woke up with the rest and packed my bag before standing in line for breakfast. After that things went surprisingly quickly as I dropped my bag at the early truck and then set off for the day at 5:30am. It was a gradual climb along smaller roads and paths for the first 12 miles to Carbondale. It was slightly cool, any cooler and I'd need mittens but otherwise survivable. 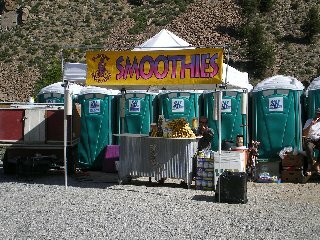 The first aid station had new type of food: animal crackers. Nice! 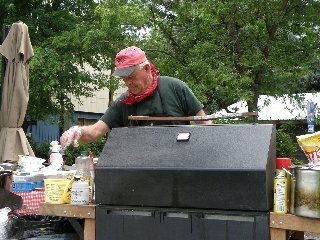 It was in a park in Carbondale. From here continued on the more major CO 133 route with a gradual climb of 1000+ft over the next 17 miles. My bike was running well and felt like a straightforward ride to the second aid station outside some coke ovens in Redstone Colorado. Lots of coal mining here. From the coke ovens we had five miles of gradual climb before the road suddenly went much more sharply uphill. Some say a grade of 8% or so. 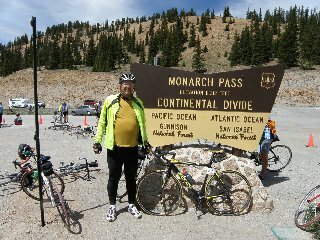 Fortunately only 3 miles long and before I knew it I was on top of McClure Pass a little before 10am. Hooray, 37 miles and more importantly the major climbing for the day. I relaxed at aid station before heading down. Fairly steep but also a slight headwind kept everything in check. 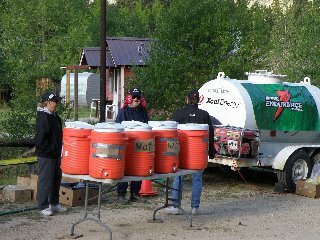 After some miles it flattend out more and we had our 4th aid station of the day. 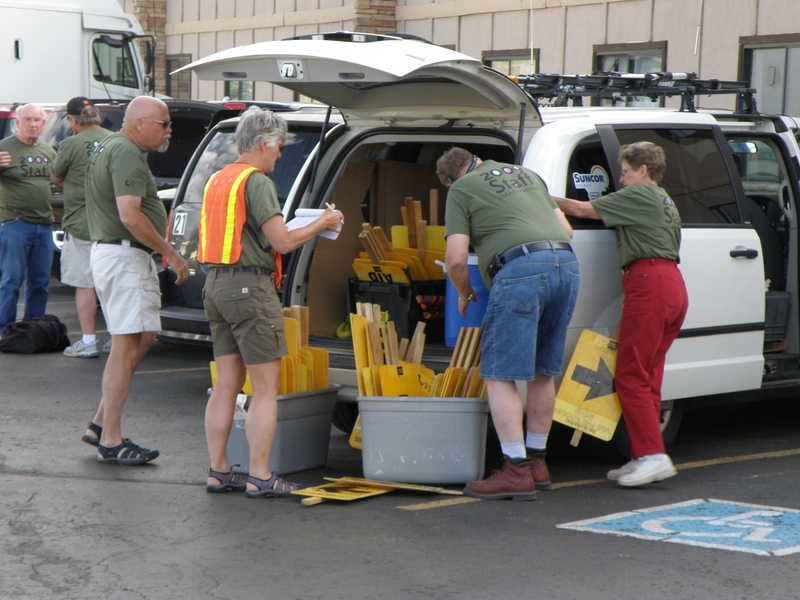 Many of the volunteers here have helped for year after year and I was surprised to have people tell us they had helped for 16 years or more. After this point came through several small coal towns including Somerset and then took a detour off to Paonia. This small town of 1500 has a mix of busineses including coal mining and also wineries and a solar concern. 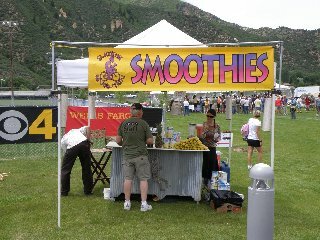 They set up a nice aid stop in the local city park. I didn't linger long as clouds were threatening. Fortunately, was able to get by with only occasional drops of rain. 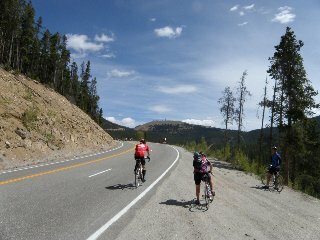 I was happy the last 10 miles were more downhill than up as we cycled last bit and into Hotchkiss just before 2pm. I got a shower and some food and otherwise looked around town before going to a very interesting seminar about roadside geology. 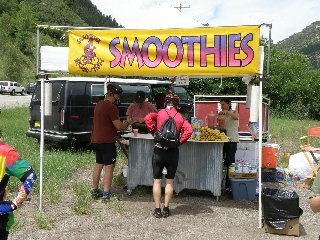 Otherwise a quiet and good first day of Ride the Rockies. A slightly challenging but very beautiful ride today (in hindsight the toughest day). 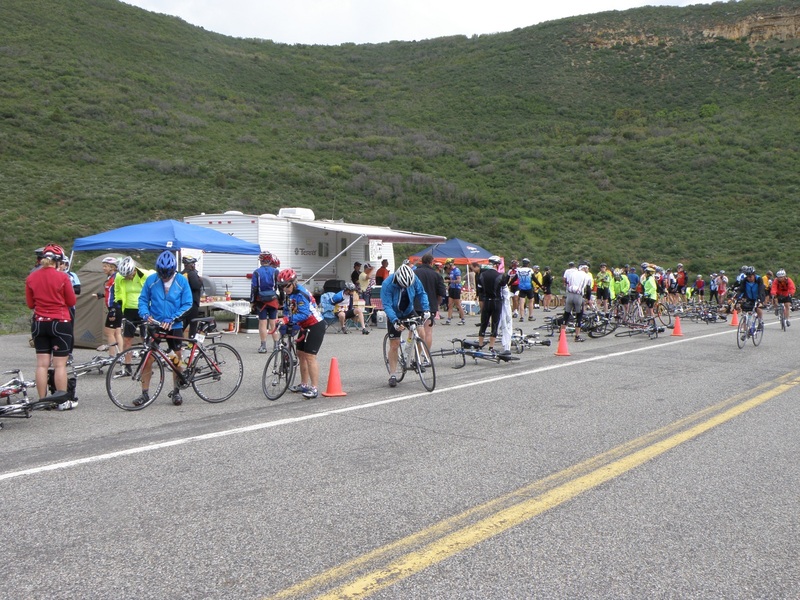 Most all the climbing was in first 32 miles and after that more rolling terrain and downhill. We also had a nice tailwind the last 20 miles into town. I was up early and had breakfast right at 5am. 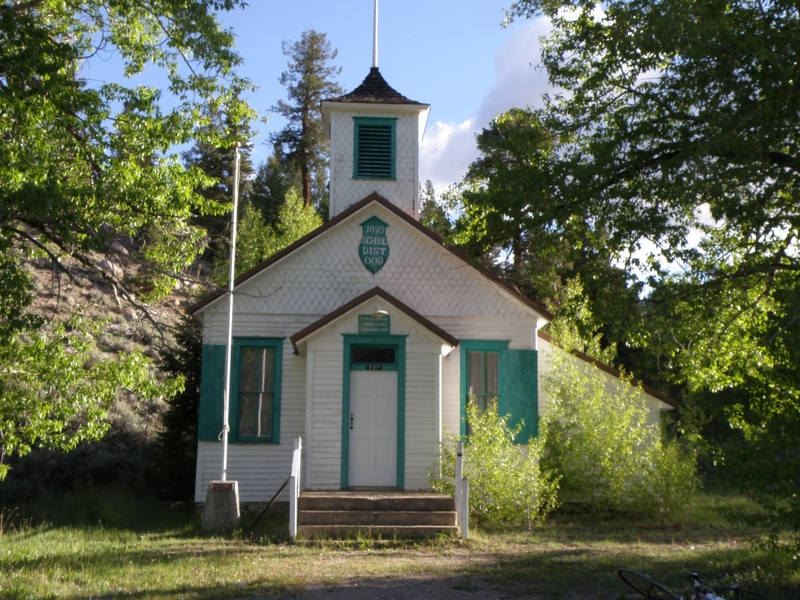 The Hotchkiss school seemed slightly disorganized but it all somehow worked out. I waited until 5:30am and then set off down the road. We started climbing almost immediately. 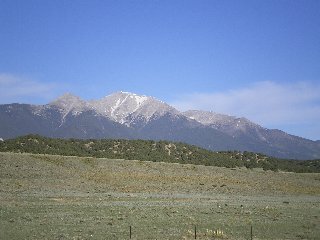 In the first 11 miles to Crawford, we climbed more than 1000ft. It was cool and Rt 92 was not very crowded. There was some ranching and farming in the area. 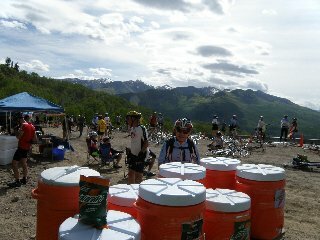 We had a nice aid stop in the park. From here the route continued uphill and occasionally had some trees as well. There was occasionally a light headwind. Not enough to really bother, but still enough to notice. I was riding pretty slowly, though had a steady pace with an occasional stop along the way. 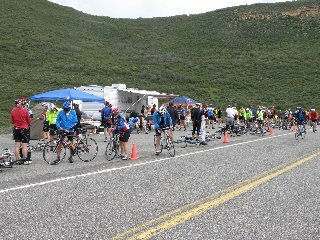 Just before the 25 mile mark, we had a short descent and then on the climb on the other side was another aid stop. It was a welcome change and time to take a break. At this point, the grade steepened. I put my gears in granny gear and started to grind out the miles. Our map said 10 miles of steady uphill. There were some beautiful wildflowers here and other excuses to stop once or twice along the way. Even better, the climb started to top out at 7 miles instead of 10! From here, we had much more rolling along the route. Still some challenging climbs but at least interspersed with downhill as well. 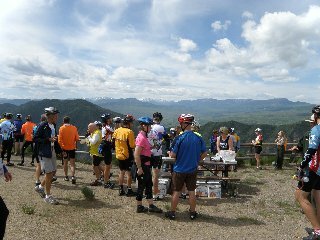 At the top at 35 miles was wonderful scenery! You could see San Juan mountains in the distance and the Black Canyon of the Gunnison in the foreground. Most of all, the route skirted along top of the mesa and looked like you could see forever. Once on top, some more rolling terrain as I skipped an aid station at 47 miles and instead continued to Sapenero at 55 miles. 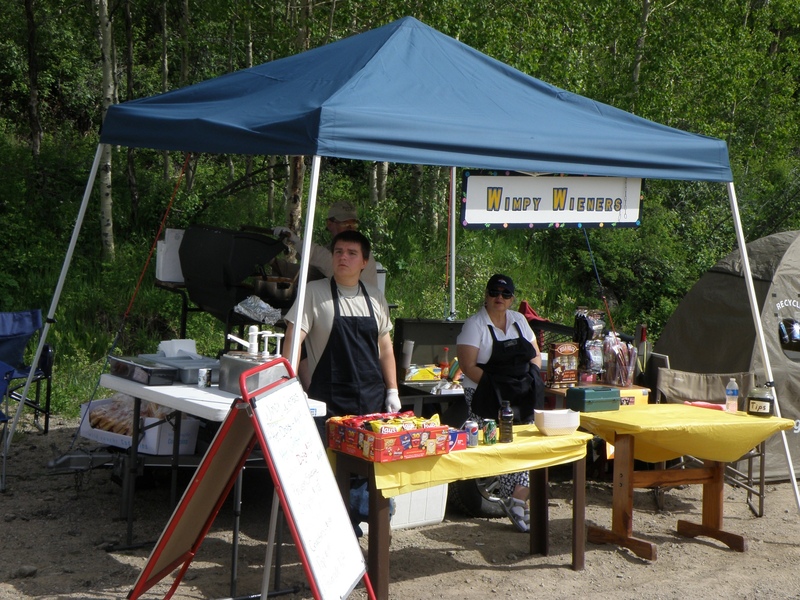 Music was playing, food vendors were around and it was a relaxing lunch stop. After lunch, tailwinds and mostly flat! 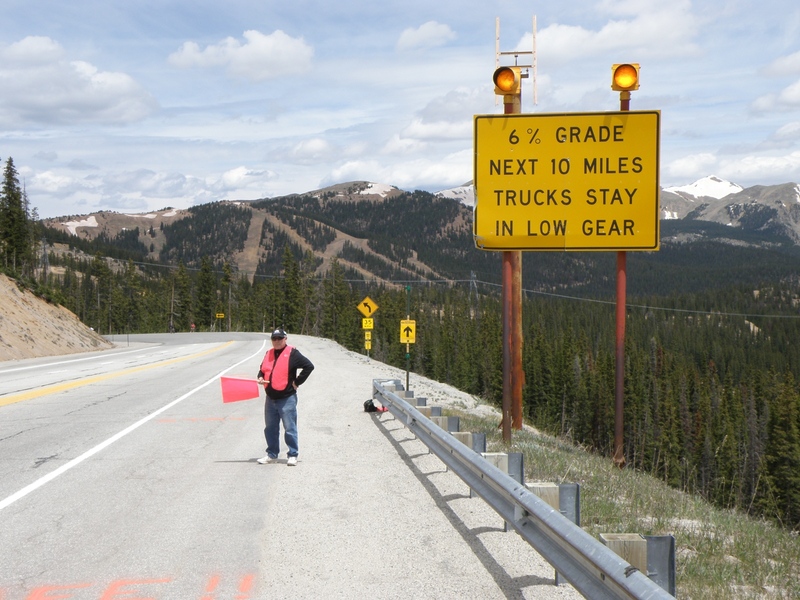 The route did have occasional rumble strips that would sandwich you on shoulder between rumble strip and guard rail. A little frustrating but tailwinds made up for it. This let me make a fairly quick ride into Gunnison and the school at end of the day. Now time to take care of chores. 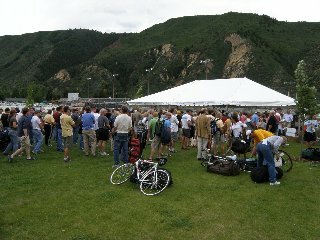 Dropped my bike at the bike parking, got some food and then stood in line for forty minutes for a shower. 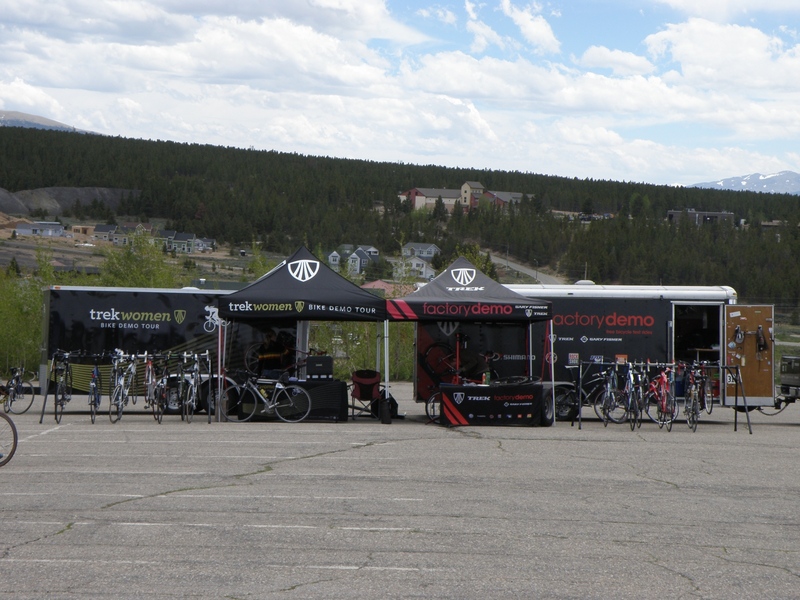 I then went to the park for a cycling seminar and also the food court. Otherwise settled in for an early evening so I could get up and ride again the next morning. 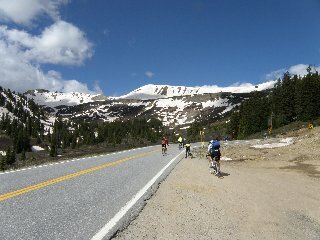 Another beautiful day of riding, this time over Monarch Pass. The first 34 miles was extremely gradual incline, followed by 9 miles of ~6% grades and then descent rest of the way. 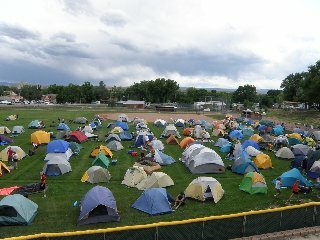 Gunnison was cold last night, almost down to the freezing mark. The gym was abuzz at 4:30am as people got ready for the day. I got an early breakfast, dropped my bag at the early truck and was back out on the road at 5:30am. 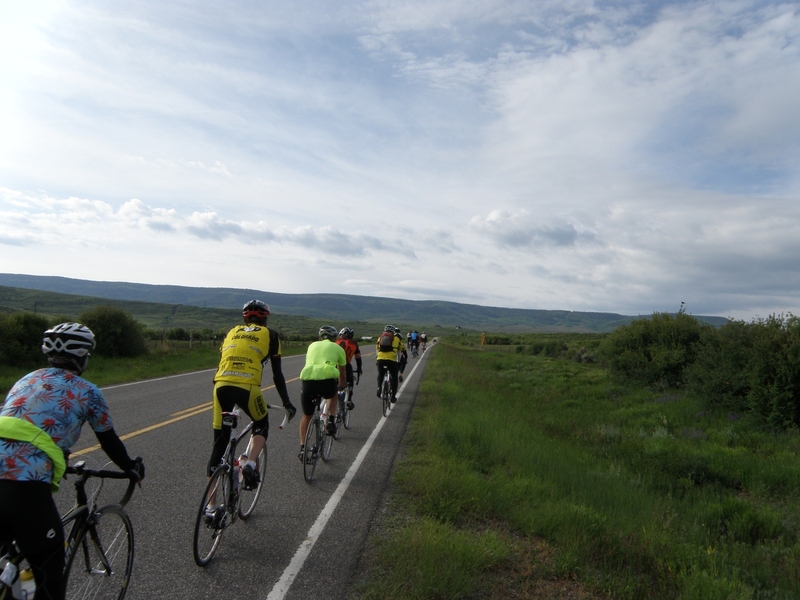 The first 34 miles were almost flat, with an accumulated climb of only 1000ft. My bike was riding well, though I noticed something I thought was my bottom bracket about once per revolution of the pedals. It was particularly pronounced in the granny gear. I was a little worried and stopped at the first aid station. There were bike mechanics there, each aid station seems to have a mechanics tent. The problem was quickly diagnosed to be not my bottom bracket, but instead the cranks were loose. I had a local bike shop make a tune-up before I left, so hopefully it was just the case that they failed to tighten the cranks. The mechanic quickly tightened my cranks and so far all is well rest of today. This definitely could have been an issue putting heavier torque on the climb. The wide open meadows narrowed slightly, but still remained mostly flat as I cycled another 16 miles to Sargents. Here was the second aid station and also start of the steeper climb (~3000ft of climb over 9 miles). In contrast to the six aid stations from yesterday, there were only three today, and apparently the Monarch Ski area didn't want vendor competition up top, so remaining vendors had to pick the first two. The climb started almost immediately on leaving Sargents. The road followed an old railroad grade and hence was a pretty consistent grade. Even with newly tightened cranks, I was slow. I stopped once or twice and even walked a short bit. However, slowly and steadily I climbed to top of the grade. 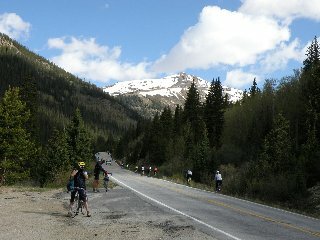 There were many cyclists up at top of Monarch Pass. Monarch Ski area was giving away a free lift ticket to Ride the Rockies riders. Nice deal and perhaps excuse to visit. I bought some lunch from vendors and otherwise refilled on water. After that, prepared for a 23 mile descent. 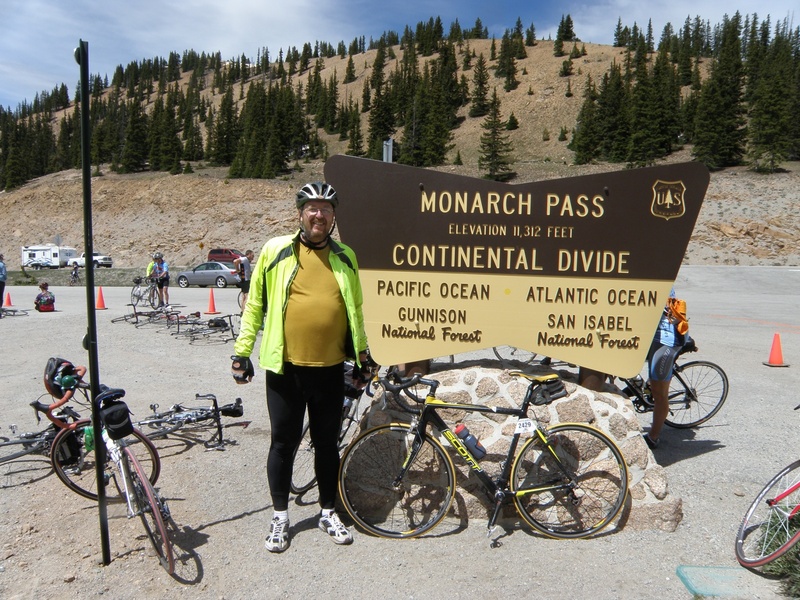 The descent was 4500ft over 23 miles and a moderately steep grade. I was still cautious so other cyclists were passing me along the way. However, still easier than level terrain. As we descended it warmed up. We also got a bit of a headwind. 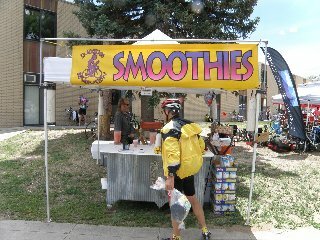 Fortunately, all a straightforward ride that got me into Salida by 1:15pm. I quickly headed to showers and was pleasantly surprised by no line, lots of pressure and luke-warm water. Nice contrast with previous days. Otherwise, looked around the area and had an easy afternoon reading the newspaper and catching up on my journal. 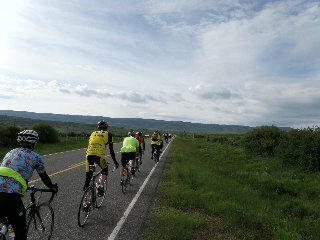 Feels like I'm starting to get some of the rhythm of cycling along as we complete the third of six days on Ride the Rockies. In the evening, I met someone who worked for CDOT and told him about the bike path. He made a call and apparently, this trail was opened later last Saturday. If so, will be good since I'll want to cycle back along the trail. An easier ride today, though it was climbing throughout the day. 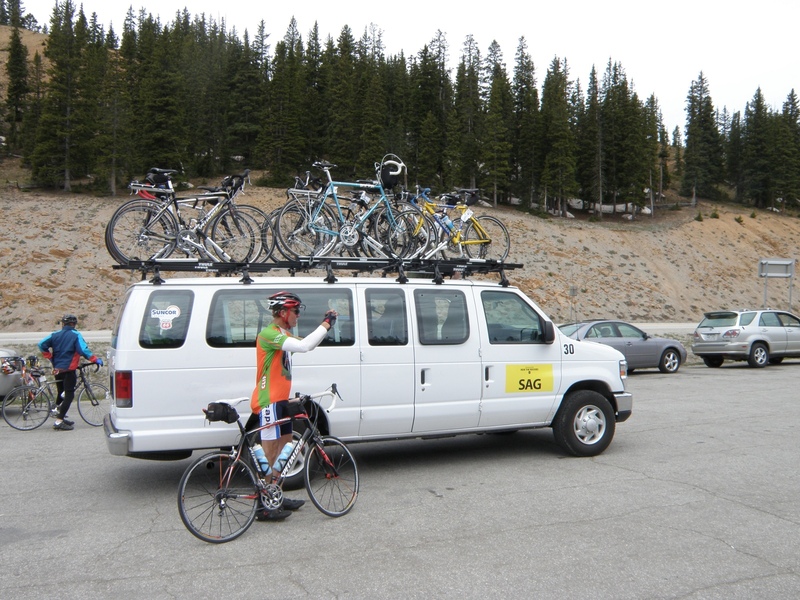 We started at 7000ft and climbed up to over 10,000ft. 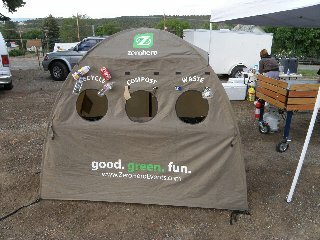 It will be cold this evening in Leadville. People were stirring early in the gym this morning. One musical alarm went off four times from 4am and then every ten minutes later. 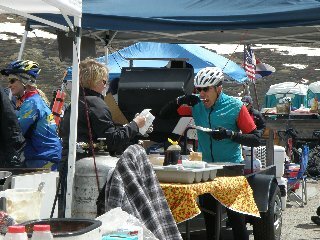 Breakfast was ready on time, so it was all quick to get up and on the road. We cycled to downtown Salida before turning north on small county road. It was warmer than leaving Gunnison, though still cool outside. My bike was riding well and I felt refreshed. There was a very slight climb. At 9 miles we turned onto US 285 and a mile later we came to the first rest stop. I made a habit of stopping at all these, and this was no different. Once replenished, I was back on the road as it continued with some gradual climbs. A little before Nathrop at 18 miles, the road even dipped down. There were many small rafting companies along the way. Two miles before Buena Vista was major road intersection at 24/285 split and we followed 24. 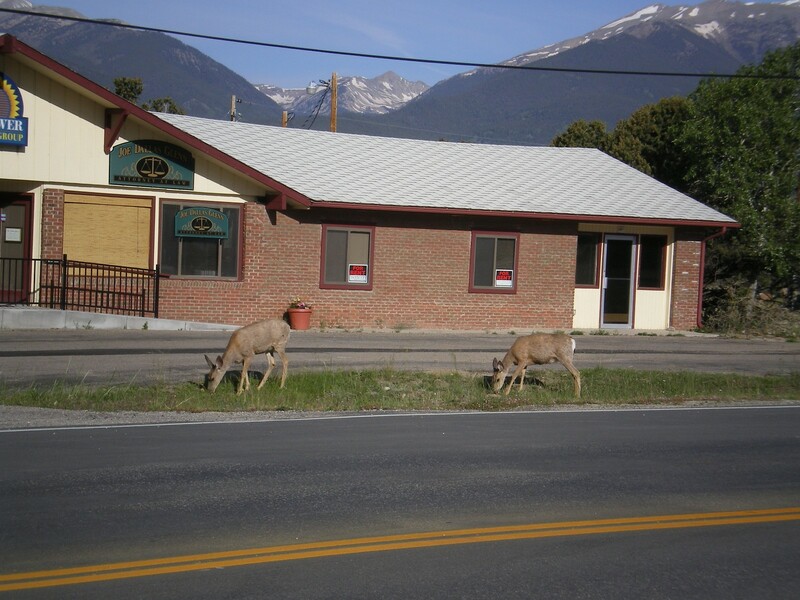 After that we passed the prison and into downtown Buena Vista to the park where we had a second rest stop. The bike was all riding well and after short stop, back on the road. The terrain narrowed some miles past Buena Vista and within this canyon was our third stop at 38 miles. Easy to ride this a chunk at a time. We continued our climb through the valley and mostly had tailwinds. The road came to a more open area and fortunately still tailwinds. 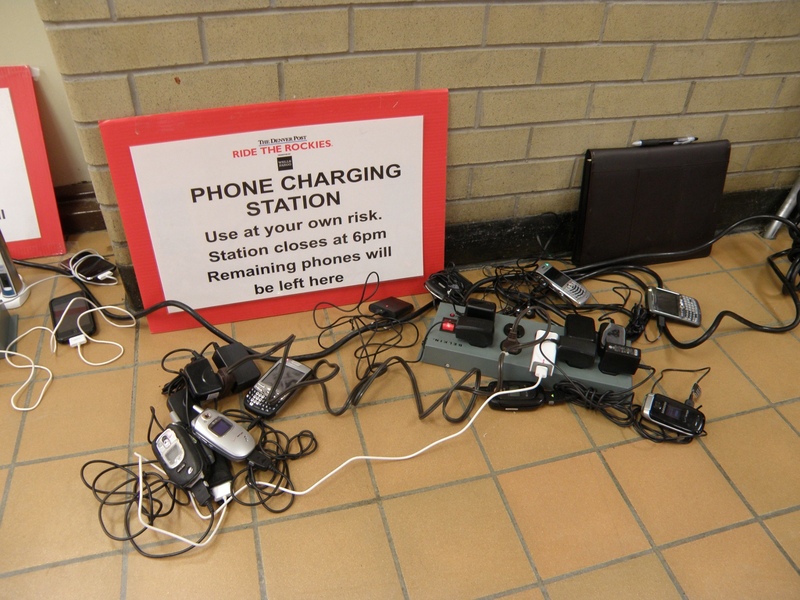 Just before the road crossed over railroad tracks, we had our third rest area at 51 miles. 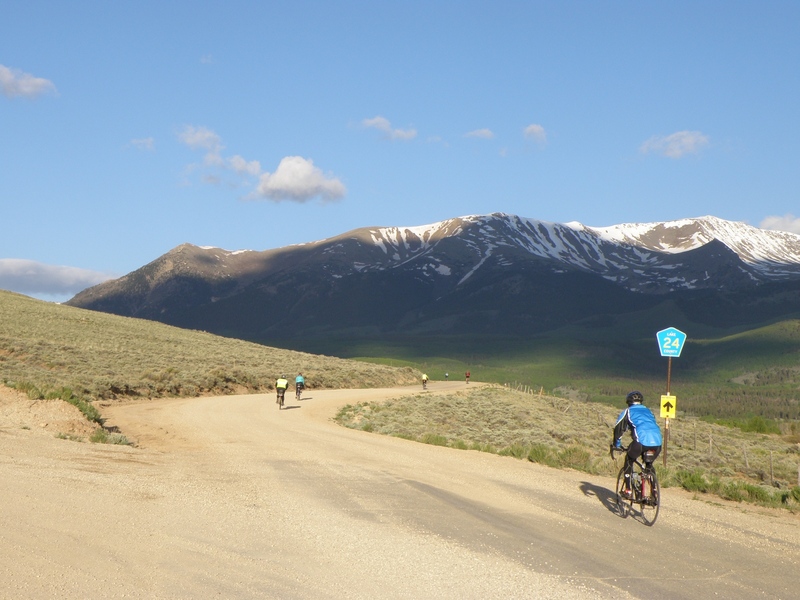 I remembered the last climb into Leadville as being a long slog. That is probably why my expectations were set low and we did this last climb as expected. Up to the High School where I locked my bike. 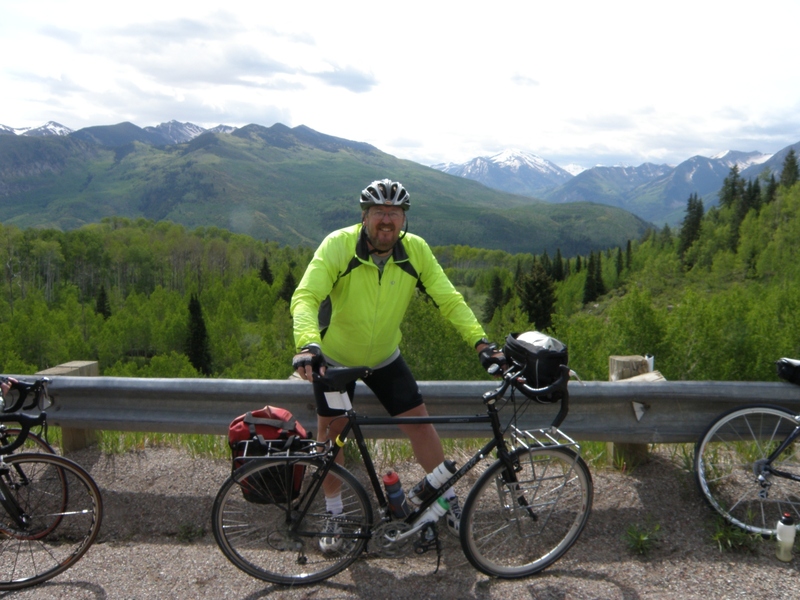 This evening at cycling seminar will meet up with a friend Paul who has a cabin nearby. Should be quieter than the gym and good place to rest before doing this highest pass tomorrow. Wow! 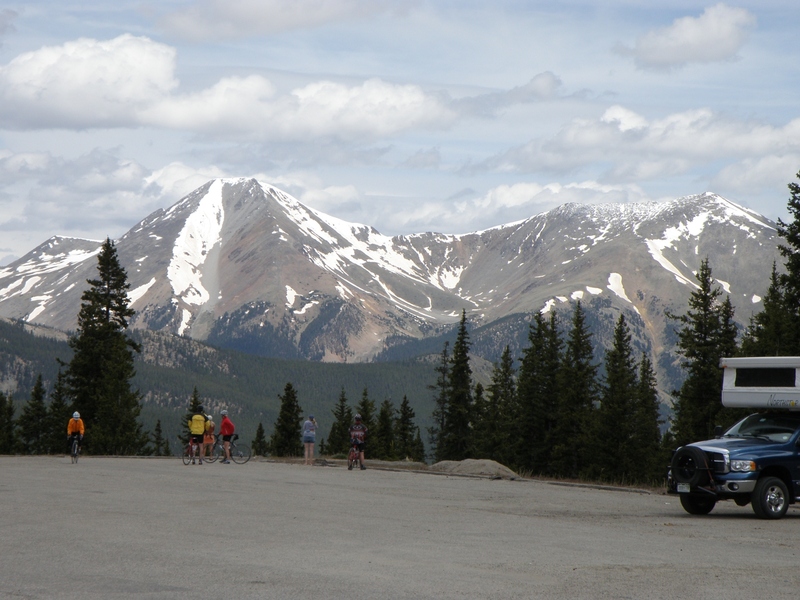 Beautiful scenery today as we climbed over Independence Pass to Aspen. Last night I stayed with friend Paul at his cabin. It was nice to have quiet rest compared to gym and also catch up some with Paul. I imposed a bit and we had breakfast early and then Paul dropped me back at the gym in time to leave before 6am. Temperatures were cool, though warmer than leaving Gunnison. 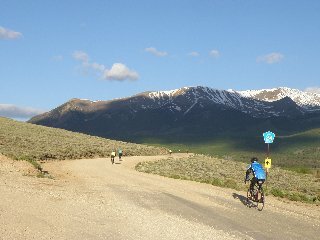 Our route started first by descending from Leadville almost 1000ft and then riding along a good gravel road to Twin Lakes. This was all easy riding and anticipation of a climb later on. I skipped a rest stop at 13 miles and instead continued to 18 miles for the last rest stop before the pass. From this point, there would be 17 miles and 3000ft of climb. I dawdled just slightly before setting off. In contrast to Monarch Pass, this climb was more intermittent. Sometimes steep and then easing off. This variety meant that you could catch a rest and then get ready for the next climb. At 31 miles we entered some switch backs and did more climbing. The scenery also became more dramatic here as we could see above timberline and see mixtures of snow and rocks in the higher peaks. 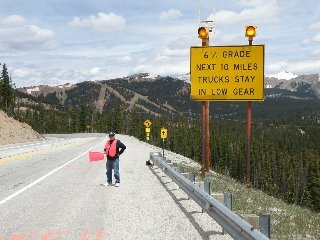 It was a slow climb, but just after 11am, I made it to top of the pass. Hooray! 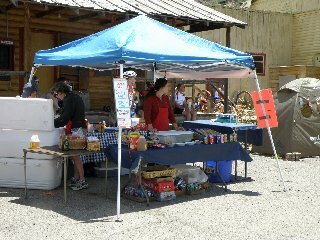 There was music playing and many vendors up here on the pass. It was a bit windy and also fairly cold. I waited for a bit, had lunch and then headed down. It was a steep descent. Occasionally the road narrowed to less than two lanes. Lots of bikes and also regular traffic meant you had to keep aware of what was around you. Fortunately, it also got warmer as we descended. Without much difficulty, made it to Aspen. 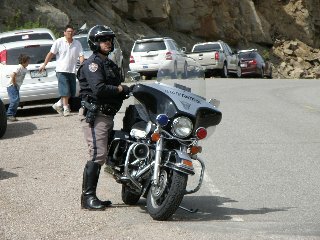 There were police and other officials directing traffic and we got through town pretty quickly. 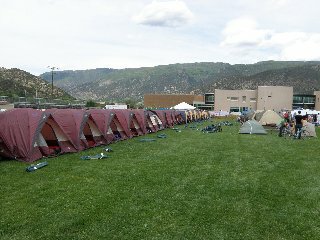 On the far end was a nice high school where we set up for the evening. Overall a pretty ride with a fair climb, but also easier than some other days we've had. Ride the Rockies came to an end with an easy ride back to Glenwood Springs followed by a nice ride back to the Eagle Airport. 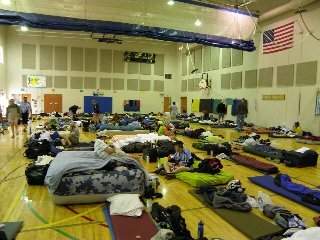 People were still stirring in the gym at 4am, though less than previous days when we there would be a tougher day. The route description was straightforward, 40 miles down the valley with 2000ft of descent. I was still up early and got a good breakfast, the only one where the hosts weren't ready right at 5am. However, quality made up for timeliness and I was soon ready. 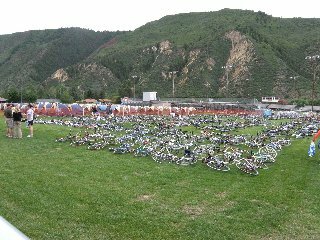 It had rained the night before, so this made me grateful that Aspen was the only host city where bike parking was inside. The school itself spoke of $ as it had a big gym with a second story indoor running track, and lots of big spaces for what seems like ~100 graduates a year. 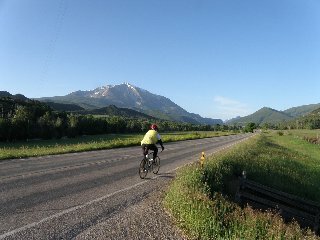 We got back on bike path as we left Aspen. Went along some nice golf courses and then mostly followed highway 82. Still some low clouds but it stayed cool. After a few miles we rejoined highway 82 before then descending through small hamlet of Woody Creek. 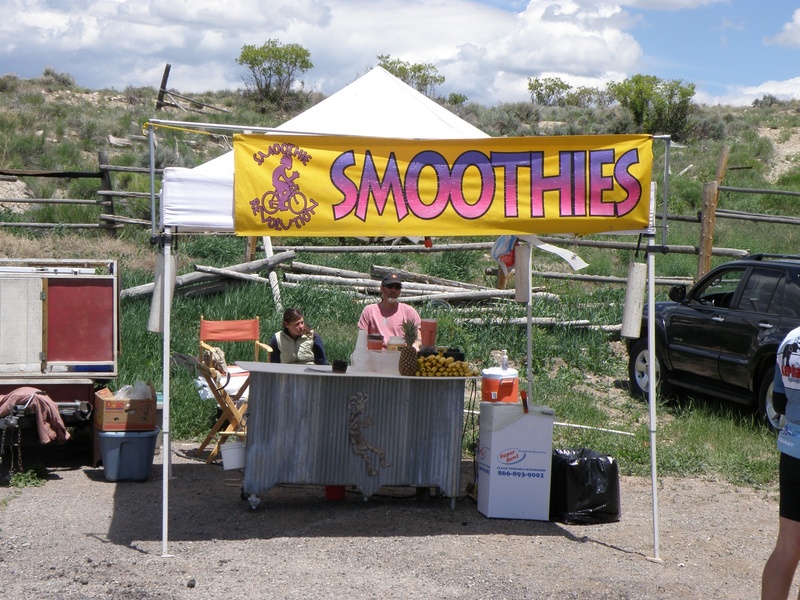 At this point we picked up the Rio Grande Bike Trail. 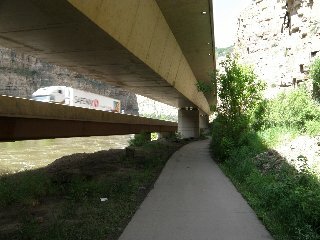 Plan would be to take this trail almost all the way to Glenwood. The trail was ~6ft wide, so glad I was early and there were fewer people out there. As we got close to Basalt, the trail suddenly went into a subdivision. I followed trail signs there, but once I got to Basalt at 18 miles, I somehow lost the trail. Ride the Rockies normally marks the routes, but they hadn't marked things here, presumably since they expected the trail to be marked. 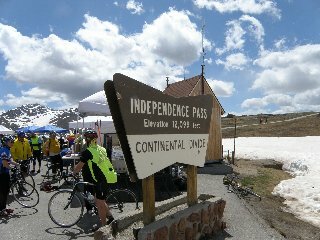 I wasn't particularly concerned since I knew I could mostly take smaller roads and if necessary highway 82 back to Glenwood. Leaving Basalt, I was definitely off track. I rode on smaller roads and at one point stopped to ask for directions. Apparently, the trail had gone on west side of the river and I was on the east. Now that I knew this, I picked best roads I could and eventually got back to the trail shortly before the second rest stop (my first) at 30 miles. 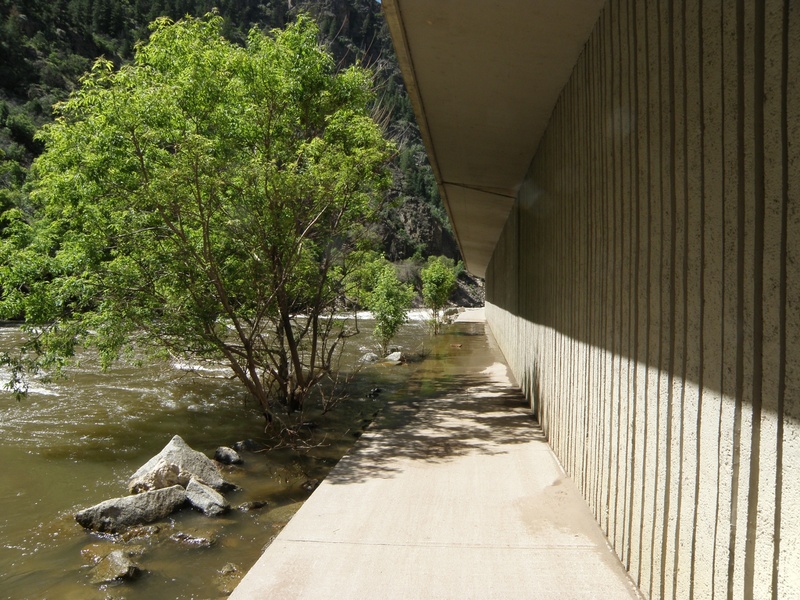 After a brief stop, a nice descent along the trail and the last miles to Glenwood Springs at 41 miles. I arrived just after 9am. 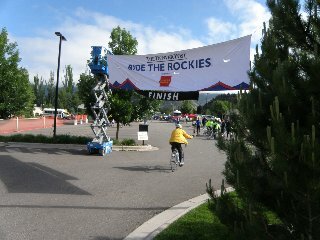 There was a finish line banner, but I was otherwise too early for the end evaluation surveys or much in way of crowds. More of that would be closer to the ending ceremonies at 1:30pm. I decided not to wait and instead found my baggage and loaded the panniers for ride back to the airport. 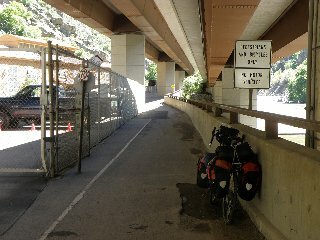 I could tell the bike was a bit heavier as I went through Glenwood and then back through the canyon. Fortunately, just a gradual incline of 1000ft back along the canyon. The gate that had stopped me before was now open and water level was even a bit lower. 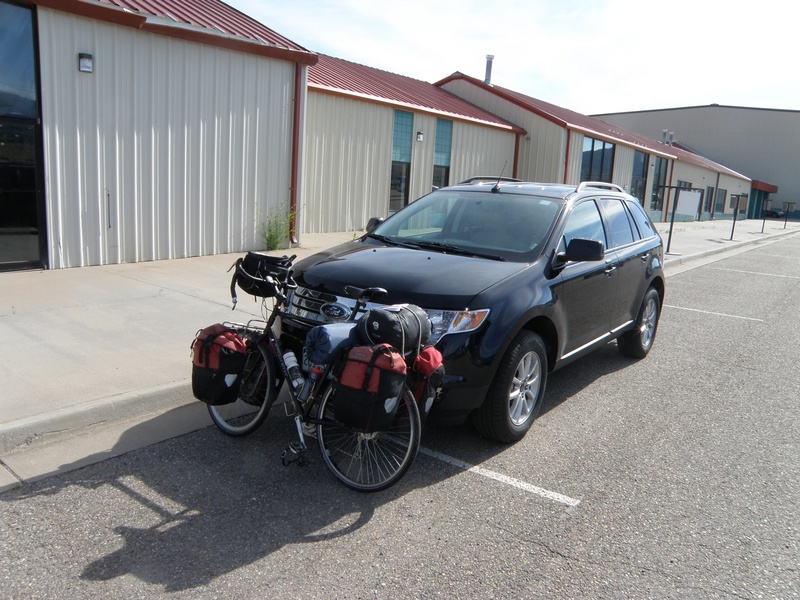 Once in Gypsum, I cycled up to the airport and found the Avis counter for my rental car. Airport was a ghost town as the commercial runway was being redone, but fortunately still some vendors. After that an uneventful ride home. 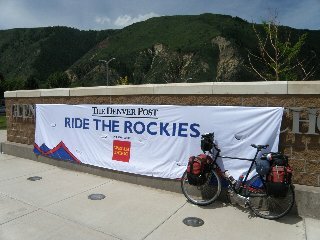 Overall, I enjoyed this Ride the Rockies. Once again, it was well organized. A few minor snafus such as too few showers in Gunnison or some missing route signs on the last day were far outweighed by a tremendous amount of logistical things that were very well organized and done. 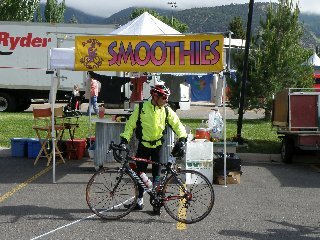 The folks who do these rides have figured out well how to organize a beautiful ride and have great support from volunteers, host towns, Colorado State Patrol, CDOT and others. This year's route was beautiful and I particularly enjoyed going over the mountain passes. There wasn't one particularly tough day and the weather was better than expected or forecast. Overall, a great ride!